Some old reminders for a New Year! “When the student is ready, the teacher will appear.” Buddhist quote. A number of thoughts and experiences came together to prompt the writing of this Post. It’s a much longer and more reflective post than usual but is offered in the loving hope that there can be no caring without sharing. Anyway, back to the slide presentation from Gordon and Linda. The slide presentation felt worthy of a post on Learning from Dogs but, thankfully, it was available in a better format for a WordPress Blog, a YouTube video. Here it is. You can see that there are some very deep but simple messages about what, in the end, are the really important things in life. Top of the list is ‘love’. Especially unconditional love. That takes me to second element of what motivated me to write this piece. Just 14 days ago, I participated in a memorial service described as ‘A Memorial Service For the Lives of Loved Ones Lost‘ at our local St Paul’s Episcopal Church here in Payson. The idea came out of a comment from friend, mentor and fellow Blog author, Jon Lavin, who had noted that the language that I used when speaking of my father, now dead for well over 50 years, was the language of a child who hadn’t been ‘released’ from that event (I was just 12 at the time) rather than that of an adult who accepts that death is part of the natural order of the world. Losing a loved one is tough, incredibly tough, and full of pain and anguish in a very deep-seated and personal manner. That’s the perspective from the loved ones left behind with more life ahead of them. But if one thinks of it in reverse, what is the one thing that we would want to leave behind when we die? It is, without doubt, that our death does not leave in the hearts and souls of those left behind, whom we loved and who loved us, pain and anguish that isn’t embraced and dealt with healthily. It was that collective unresolved pain and anguish that brought all of us together at that Service on the 20th. It was a wonderful release for all present. During the Service the Advent Wreath candles were lit. Here are selection of the thoughts that were voiced and released as the four candles were lit. This first candle we light is to remember those whom we have loved and lost. We pause to remember their name, their face, their voice, the memory that binds them to us in this season. This second candle we light is to redeem the pain of loss; the loss of relationships, the loss of jobs, the loss of health. We pause to gather up the pain of the past and offer it to God, asking that from God’s hands we receive the gift of peace. This third candle we light is to remember ourselves this Christmas time. We pause and remember these past weeks and months and years; the disbelief, the anger, the down times, the poignancy of reminiscing, the hugs and handshakes of family and friends, all those who stood with us. This fourth candle is lit to remember our faith and the gift of hope which the Christmas story offers us. Go back and see those words that accompanied the lighting of the third candle. It included “to remember ourselves“. Once again, it’s loving ourselves, accepting that we spend our lives doing our best; in other words the answers to the unresolved issues that can haunt us is simple acceptance of who you are and being at peace with you! Now I’m conscious that this is running on a bit but I pray that this is reaching out to others – we all need better clarity at times in our lives. So before I go on to the third and last element which has me in front of this keyboard, let me share what I wrote, privately, a few days before the Service on the 20th in trying to make sense of my own feelings about the loss of my father. If we don’t embrace who we are and why we are who we are, i.e. real self awareness, we are condemned to being emotionally dysfunctional to a greater or lesser degree for a long time. If we understand and love ourselves, avoiding the ‘easy’ route of constantly reminding ourselves what is ‘wrong’ with us, not being a victim to guilt, and on and on, then we see a better, softer, more loving world though our eyes. Then the world reflecting back what we think about most rewards us with a better, softer, more loving world. Loving ourselves, letting go, opening our arms to peace and joy is the true gift that we have really been given by the ‘loss’ of the loved one. What I am embracing is that the emotional consequences of my father’s death, all those many, many years ago, created degrees of emotional dysfunction that went on for far too long. Being free to walk clear of those emotional ‘hooks’ is not only so much better for me and those who love me, it is exactly what my father would have wanted! Being clear of deep emotional burdens allows us to love ourselves and from that comes the greatest personal gift of all – unconditional love for others. There’s that love word again! OK, now to the third and final element! Wake up at the back there! The year 2010 was for me and Jean the epitome of a joyous journey that started, coincidentally, on a December 20th, this one in 2007. On that evening in a bar/nightclub in San Carlos, Mexico, six days after I had arrived to stay with friends who had known Jean for many years, that I asked Jean for a dance, put my arm around her waist, and experienced something mystical – I knew she was the woman I would love to my last breath. Thirty-five months later, on November 20th 2010, Jean and I were married in St. Paul’s Episcopal Church, Payson, Arizona. We had been living together in Mexico since September 2008 and in Payson since February, 2010. In Payson we have found a wonderfully interesting, generous and supportive community and our 13 dogs just love our rural home tucked into the forest; it is a very beautiful existence. Frankly, I find it almost impossible to get my head around in any rational way as to how life can be so randomly alluring – we really have so little control over it all! Save for how we accept and love ourselves. Thus my own haltering and challenging steps to better self-awareness have given me more than I could ever have dreamed of. This realisation has left me feeling pretty emotional over the Christmas period. From those emotions has come, for the first time in my life, the awareness of mortality. Not in some sort of intellectual homage to the notion that it doesn’t go on forever. No, this is a real, hard-edged, realisation that I am going to die! It’s a clear vision, as clear as those beautiful stars shining out from the brittle cold, night sky over Payson very early on New Year’s Day. My mortal life is going to end. And that, my dear readers is that. 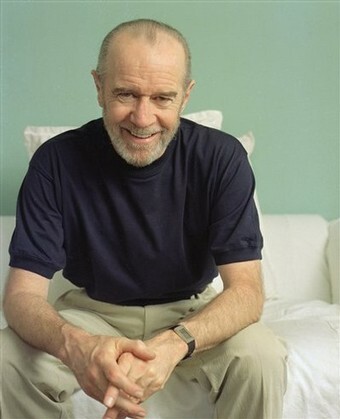 Go back and watch that video from George Carlin, think about those past loved ones in your life and what they gifted you and, above all, feel your own love for you, savour it, and share it around.